We are passionate about healing homes, one at a time. We do this by finding hidden mold growth and helping people find the best ways to get mold and allergens out of their lives. Based in Princeton NJ and NYC, we specialize in the detection, location, diagnosis and prevention of indoor mold and moisture problems, and deal with other indoor air quality issues as well. 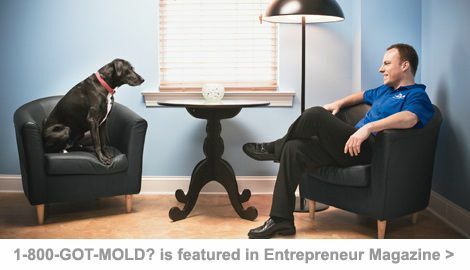 Indoor mold growth is a health issue. In the overwhelming majority of our cases, someone in a home is chronically ill, doctors and family members are puzzled, and we are called in just on the chance that mold is the culprit. In a majority of these cases, mold is indeed the source of the problem. Seeing health issues evaporate after proper remediation is done is what keeps us doing what we do. The 1-800-GOT-MOLD? journey began in 2003, when founder Jason A. Earle brought Oreo, the first mold detection dog in the northeast, home to Princeton. 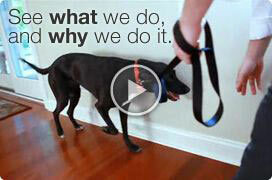 Oreo was also one of the first animals nationwide trained to perform this service. By combining tools like infrared thermal imaging cameras and electronic moisture detection with mold detection dogs, we can locate elusive mold and moisture problems caused by faulty synthetic stucco (EIFS) installations and many other hidden sources. This combination of proven technologies is now widely accepted throughout the industry as the most comprehensive non-destructive, cost-effective method of evaluating hidden indoor mold problems. While traditional testing methods give you a vague idea that you may have a mold problem somewhere, they often provide very little clue as to its source or location. 1-800-GOT-MOLD? is often called in after other consultants have failed to diagnose or locate a problem. We have fine-tuned our procedures over the course of thousands of inspections to develop our proprietary methods. So you can rest assured you’ll get time-tested results, the first time. Oh, and we never, ever get involved in the remediation/restoration side of the job, except as a consultant to our customer. If final test results indicate a problem, our consulting work could include writing a scope of work for remediation crews, supervising the job setup and material removal, and performing clearance testing to ensure the work was done right. If the work is not properly done, the remediation contractor must fix it at their cost. A poorly done remediation job will make an indoor mold problem worse, by spreading it all over the house. We want to make certain this doesn’t happen to you.